How soon after baby teeth come in should parents begin an oral hygiene routine? That’s a trick question! Parents should begin cleaning the baby’s mouth within the first few days after birth. 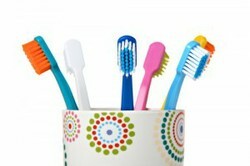 Once the teeth start coming in, parents can use a child-sized toothbrush with water to brush the teeth and gums gently. Wait till the child is two years old to begin using toothpaste, and talk to the dentist about the kind to use. A pleasant-tasting toothpaste and a positive attitude can help little kids begin a lifetime of good oral care. Learn about oral health issues like diseases, dental procedures and, of course, new antioxidant oral care products to help your body fight free radicals. The dental industry is clamoring for more information and products to fight oxidative stress, caused by free radicals from smoking and other negative factors. Learn about special antioxidant dental products now available to consumers. Oral gels containing chemicals like phloretin and ferulic acid, both naturally-occurring antioxidants, can be used to help the body fight repair oxidative-stress naturally. Read an in-depth explanation of exactly what free radicals are, what causes them and how to help your body eliminate free radicals with antioxidants. A milestone for every parent is a baby’s first tooth. Those tiny, pearly bumps usually erupt between six months and one year. For some mothers, it signals the time to wean a baby from breast-feeding, although babies are often nursed for several years. In any event, those baby, or “primary” teeth, help the child eat more kinds of solid foods. They also play a part in speaking. By the time children are three years old, they should have a complete set of 20 primary teeth. The days and weeks before teeth break through the gums can be difficult for some babies. Sore, tender, inflamed gums can make a baby cranky. A spoon chilled in the refrigerator for a few minutes can be soothing, as can a cold, damp, clean piece of cloth or gauze. Even a clean finger can massage the baby’s gums to provide relief. If the baby is big enough, an icy treat may work. Teething rings are manufactured for this purpose, including some that have liquid or gel that can be chilled. Physicians or dentists can provide advice for other remedies, such as numbing gel, pain relieving medicines, or topical antioxidants to apply to the gums. Question: How soon after baby teeth come in should parents begin an oral hygiene routine? That’s a trick question! Parents should begin cleaning the baby’s mouth within the first few days after birth. Plaque, the sticky film that results from bacteria and the sugars in food, starts forming even in tiny infants. After every feeding, the baby’s mouth and gums should be gently wiped with a clean piece of gauze or other fabric. About six months after the first tooth comes in, and before a child is one year old, it’s time for a well-baby check-up at the dentist, according to the American Dental Association. The dentist can spot the beginnings of any problems, and provide information and instruction on proper oral care. Most dentists are happy to schedule a baby’s dental visit; some dentists specialize in pediatric dentistry. What else can parents do to make sure their little ones’ teeth are in good condition? Be careful about how much sugar they consume, and especially avoid letting juice, milk, formula or other liquids linger in the mouth during a nap or overnight. It’s best for a baby to finish a bottle or other feeding before sleeping, and a quick cleaning of the gums is a good idea. Fluoride is another good idea for baby teeth. It is incorporated into teeth as they develop, and it protects the surface of teeth to help prevent decay by allowing teeth damaged by acids to remineralize. Most public water supplies contain fluoride, and nearly two-thirds of the U.S. population has tap water containing fluoride—either naturally occurring, or added at the water processing plants. Although some object to public fluoridation of water, the Center for Disease Control (CDC) recognizes it as one of the 10 greatest public health achievements of the 20th century. Still, too much fluoride can cause illness. Children younger than six should be supervised if they are using toothpaste with fluoride, and kids younger than two shouldn't use it at all, unless instructed to do so by a dentist. Parents who use bottled water to mix formula should consult a dentist to determine if their babies are getting sufficient fluoride. As your children grow older you can introduce other naturally healthy oral care treatments into your family's oral hygiene routine, like antioxidant toothpaste, oral gels and mouth rinses. The Oral-Systemic Link is a new concept being discussed heavily in the oral care field, explaining the connection between health in the mouth and health in the rest of the body. Inflammation is a natural reaction to infection or damage in the body's tissues. Understand how oxidative stress caused by free radicals triggers and worsens oral inflammation. Antioxidants are one of nature’s way of putting out fires in the body. I started brushing my babies teeth as soon as they came in. I didn't use adult tooth paste rather I opted for a chemical free baby safe paste. To this day my kids have no calories and my oldest is 16.